SV Grün-Weiß Mestlin e. V.
The SV Grün Weiß was founded in 1949. 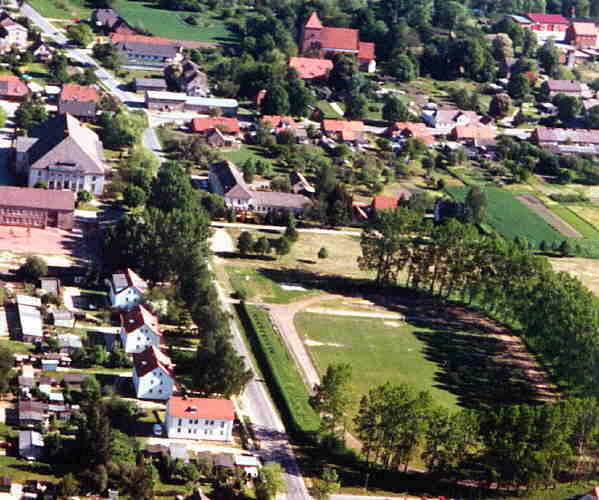 It's mostly due to the commitment of the coach Manfred Ziebarth that the soccer players from Mestlin are well-known even far beyond the borders of Mecklenburg. The SV Grün Weiß Mestlin was founded as a company sports club called "Traktor", on the 10th of December in 1949. It's mostly due to the female soccer teams that Mestlin has been becoming more and more popular, not only in Mecklenburg, since the opening of the Wall. 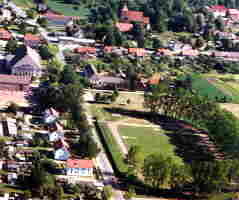 picture left: birds eye view of the Mestlin sports area, on the left border the cultural house, on the top border the church (click on the picture for a greater scale). Back in 1992/93 the girls had their first games against the SV Spornitz / Dütschow. Since 1994 they have also been playing against female soccer teams from Schwerin. In 1995 the team from Mestlin won a second place at the tournament "Goldener Fußballstiefel" ("golden soccer shoe") in Denmark. In the season of 1996/97 the district West (M-V is being divided into the "soccer districts" West-, North-, and East-Mecklenburg) of the regional soccer association introduced the points system for girls teams on district levels. The sport magazine "kicker" reported on February 13th, 1995 about a common action with the soccer team from Hamburg "Hinschenfelder Sportverein": a trip to Turkey. Not only the soccer matches were important, also the possibility to learn a lot about the culture in the far country. 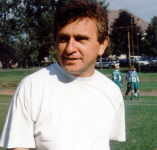 Since then the girls from Mestlin and their coach Manfred Ziebarth could win a number of titles and cups. In1998 there was the first regional championship for Juniors. The girls from Mestlin managed to win the title of the D-Juniors (B: Nagema Neubrandenburg). As a reward for the consequent work and the engagement of the coach Manfred Ziebarth (see picture on the left) the department soccer (female) of the SV Grün Weiß Mestlin e.V. received the prize of the Youth Help Committee for exemplary performance in working with youths in the district of Parchim in 1998.
the regional championship had been carried out in Sternberg. The district champions of West-, North-, and East-Mecklenburg took part. The North-East German Championship (Brandenburg, Saxony, Saxony-Anhalt, Thuringia, Berlin, Mecklenburg-Western Pomerania) took place in Berlin in 1999. 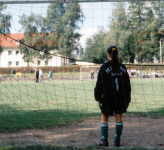 The B-Youth (fem) could finish the successful season as runner-up in the stadium near the Wuhlheide. And here are the names of some of the successful girls: Antje Drefahl, Janette Faut, Kerstin Jäger, Kati Krohn (now Grabower FC), Julia Koß, Svenia Kurzmann, Liliane Reinkober, Kathleen Rieger, Cathleen Thiel, Stefanie Weichelt, Syndia Wolff. In the season of 99/00, Mestlin is going for new territory: the male team of the SV Grün Weiß Mestlin is going to play in the district league for the first time. Good Luck!! The SV Grün Weiß Mestlin is going to celebrate its 50th anniversary in December, 1999.